WATCHING an elderly lady fetch two heaving pails of water in Yunnan was enough to move director Koh Lian Hock to initiate a sea change in his career. Mr Koh, who was vice-president of market services at the Singapore Exchange (SGX), found himself questioning his direction in life. He had been invited by a friend to have a look at water treatment projects in parts of rural China four years ago, an experience he terms a "social awakening". "Rain or shine, the old lady would have to carry pails of water, each about 20kg, twice a day," says Mr Koh, 45. "I saw the impact of not having water at all, and I realised there's a lot to be done." His life change came fast. 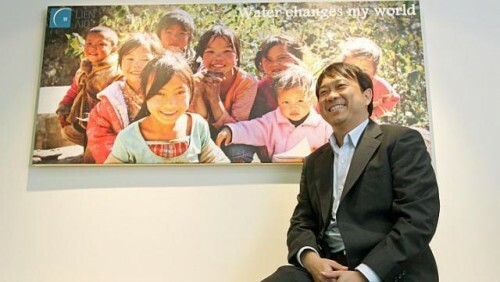 It took just a few weeks after returning from Yunnan for Mr Koh to make the switch from scaling the corporate ladder to educating villagers on water hygiene in China, Cambodia and Vietnam. "My wife said: 'What makes you so sure that when you're in your 50s, you'll have the energy or be around to do this?'" he recalls. "If you find it's something that's worthy, then do it now." In a way, it seemed as though fate had a hand in helping him make his decision, says Mr Koh. At the time, the chief executive officer of local charity Lien Aid had just left, and the organisation was looking for someone to take the reins. With his wife's encouragement, Mr Koh leapt at the opportunity. His experience with business development and management in the corporate world came in handy, as he led the organisation's drive to make clean water and sanitation accessible to rural communities in Asia. While he is the head of the non-profit organisation, Mr Koh maintains: "I don't believe in charity." Rather, he believes in empowering benefactors with skills to continue whatever work the aid agency has started. "We teach them how to fish, instead of just giving," he says. "I believe (our partners) like our approach of helping to set up social enterprises... and the fact that we focus a lot on sustainability and capacity building." This policy has helped Lien Aid scale new heights, securing over $900,000 from both listed firms and international private organisations over the past year. This is the highest amount the agency has received in a year, and it expects to help around 200,000 people in Cambodia, China and Vietnam by the end of this year - twice the number it reached last year. The charity is the first in Singapore to secure funding from British private bank Coutts, which recently inked an agreement to donate a six-figure sum to Lien Aid's Village Management Trainee programme. This teaches young graduates in China to oversee water projects at the community level. Water treatment firm United Envirotech has also donated $300,000 to the same project as part of its corporate social responsibility efforts. The group's community water enterprise project, which involves the building of water treatment facilities and teaching villagers how to manage them, has also garnered €150,000 (S$258,000) from the Prince Albert II of Monaco Foundation and US$282,000 (S$352,000) from the United Nations children's fund Unicef. The initiative is targeted at Cambodia's Tonle Sap Lake, where access to potable water is a problem. Mr Koh expects that this funding will allow up to five projects to begin in Cambodia next year, while another 14 to 18 will be added from 2015 to 2016. Since it was formed in 2006, the non-governmental organisation has helped around 520,000 people in six countries and made clean water available to 89 schools, 59 health-care facilities and 2,647 rural villages in Asia. With a team of just 17 full-time staff, Mr Koh says it is even more important to run the organisation like a corporate firm, adding that "95 per cent of the way we work must be the same - efficient and effective". "The only difference is the bottom line. In commercial firms, it's about making money, but in our case, it's about servicing the beneficiaries. That's where you get satisfaction, and that's something you cannot measure."